IBCB 425 showed a mortality power of 68% - 90%. complex associated to the virulence, including chitinase. non-reducing end, releasing dimers (GlcNAc)2 [11,12]. 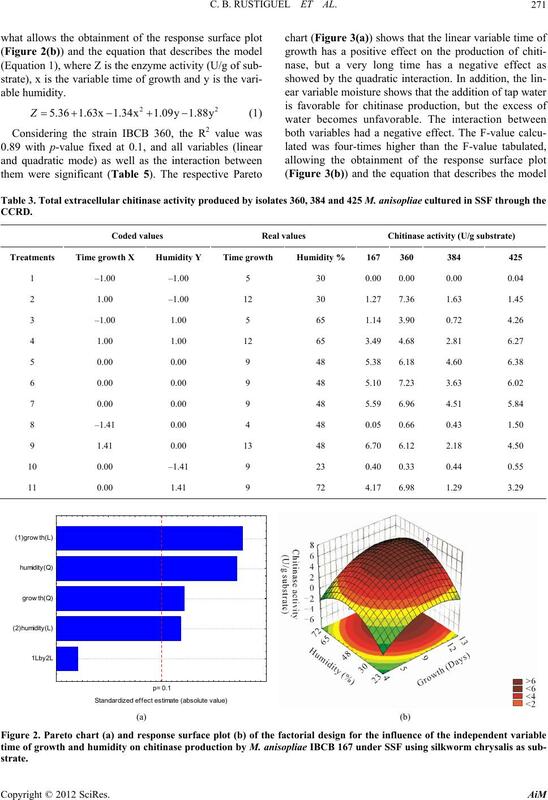 the level of chitinase production by different strains of M.
anisopliae and their virulence has not been analyzed. 76% monitored by a thermo hygrometer. h and harvested by gauze using Whatman paper No.1. 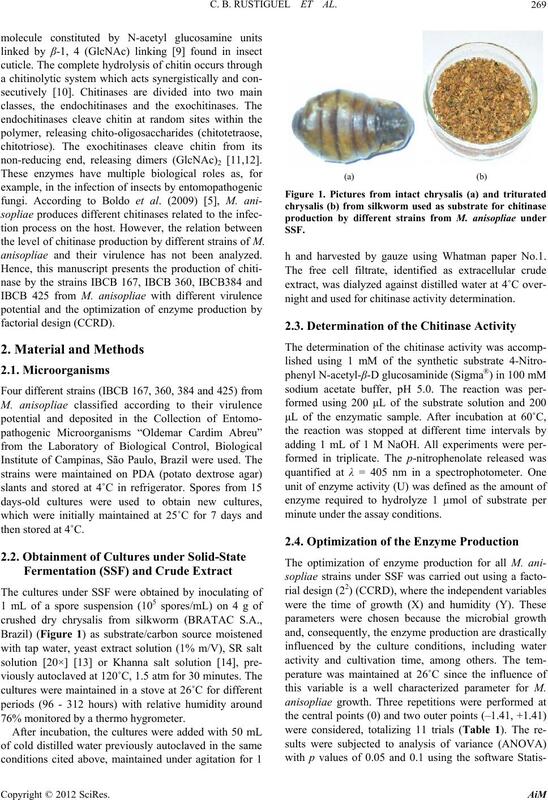 night and used for chitinase activity determination. minute under the assay conditions. this variable is a well characterized parameter for M.
C. B. RUSTIGUEL ET AL. ber of independent variables in the study. different isolates of the fungus M. anisopliae in SSF. higher if compared to the IBCB 384 strain. example the cultivation period and the humidity in SSF. 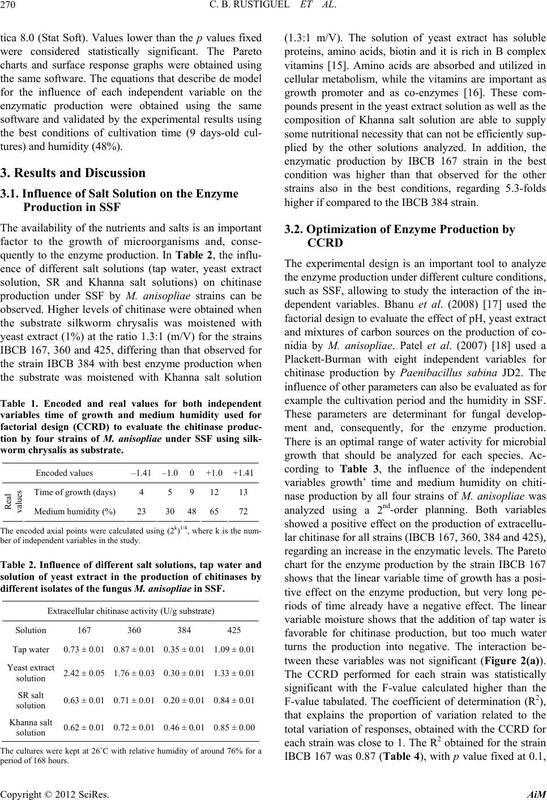 ment and, consequently, for the enzyme production. tween these variables was not significant (Figure 2(a)). duction isolated 167 M. anisopliae grown in SSF. Regression coefficient: R = 0.87; Ftab 0.90,3;7 = 3.07.
duction isolated 360 M. anisopliae grown in SSF. Regression coefficient: R2 = 0.89; Ftab 0.90,3;7 = 3.18.
time and y is the variable humidity. able growth time and y is the variable humidity. duction isolated 384 M. anisopliae grown in SSF. 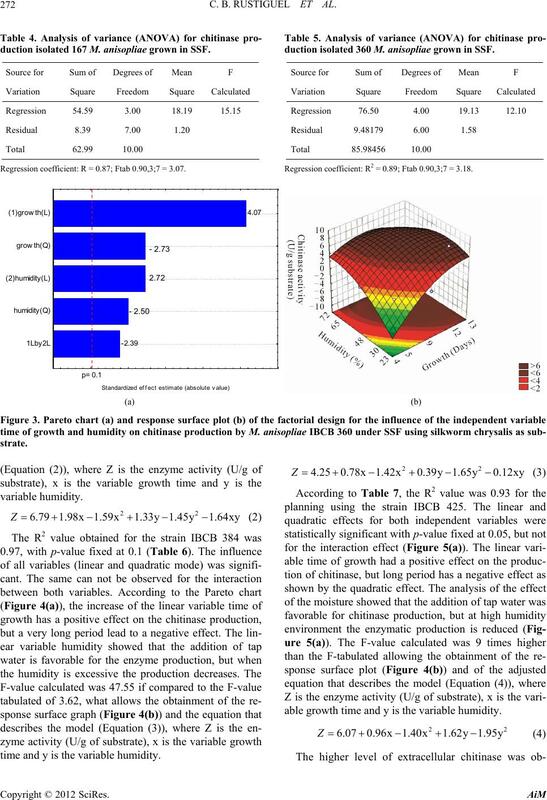 Regression coefficient: R2 = 0.97; Ftab 0.90,3;5 = 3.62.
according to the analysis of the surface response plot. duction isolated 425 M. anisopliae grown in SSF. 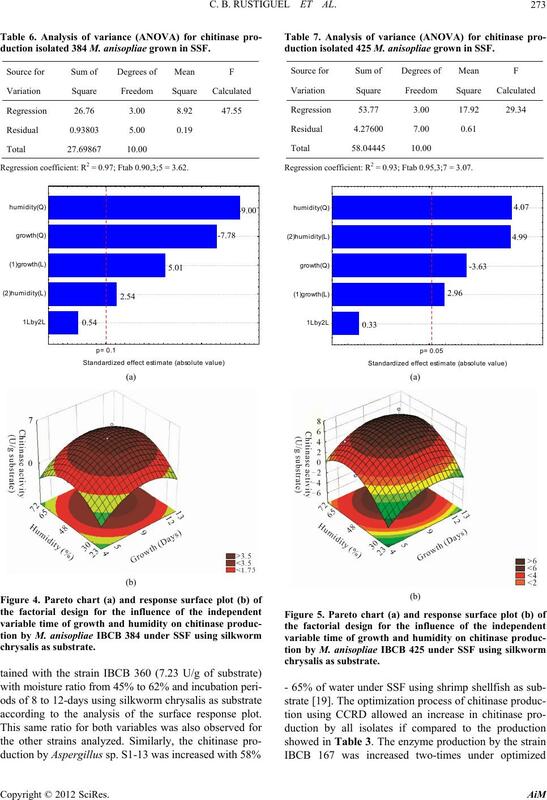 Regression coefficient: R2 = 0.93; Ftab 0.95,3;7 = 3.07.
different strains of M. anisopliae under SSF. 5.36, 6.80, 4.25 and 6.07 U/g of substrate, respectively. biological residues is a preoccupation around the world. strated by Da Silva et al. (2005) . 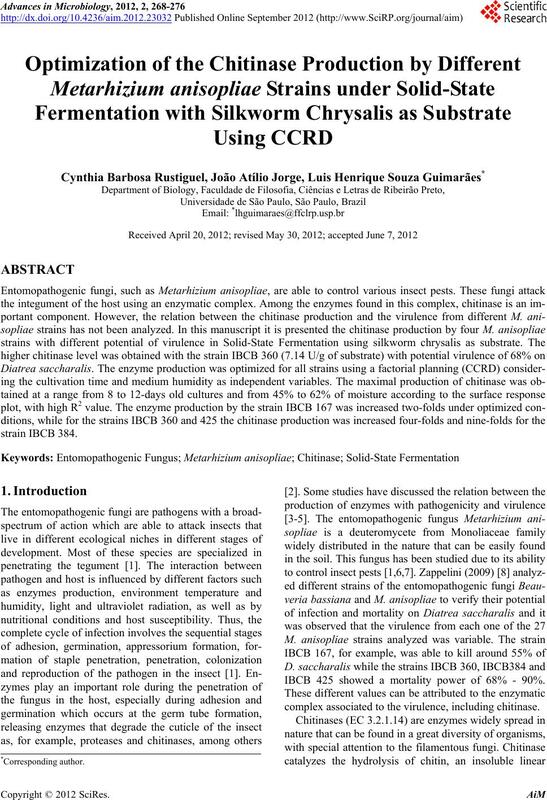 genic fungi is related to pathogenicity and virulence. ruvianus was demonstrated by Boldo et al. (2009) . tion of the material used as substrate. from that observed for the control of D. saccharalis. ducer although this strain is not the best controller of D.
also involved in the infection. R. J. St. Leger, P. K. Durrands, R. M. Cooper and A. K.
Micrology, Vol. 129, 1978, pp. 71-77. M. V. Da Silva, L. Santi, C. C. Staats, A. M. Costa, E. M.
 J. Y. Boldo, A. Junges, K. B. Amaral, D. C. Staats, M. H.
peruvianus,” Current Genetics, Vol. 55, No. 5, 2009, pp. technology, Vol. 61, 2003, pp. 413-423. Vol. 28, No. 5, 2005, pp. 871-879.
bial Technology, Vol. 26, No. 7, 2000, pp. 473-483.
thology, Vol. 161, No. 6, 2006, pp. 345-360. D. M. F. Van Aalten, D. Komander, B. Systand, S.
Academy, Vol. 98, No. 16, 2011, pp. 8979-8984.
technology, Vol. 11, No. 2, 1995, pp. 242-243. 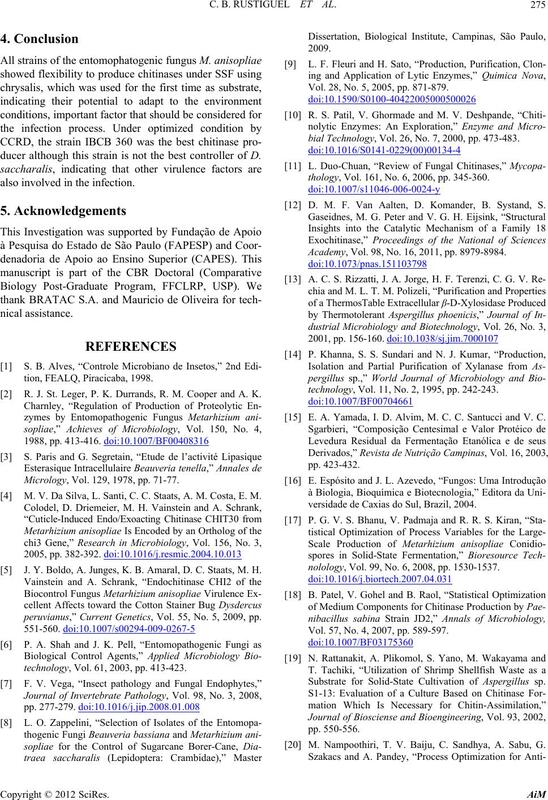 E. A. Yamada, I. D. Alvim, M. C. C. Santucci and V. C.
versidade de Caxias do Sul, Brazil, 2004.
nolology, Vol. 99, No. 6, 2008, pp. 1530-1537. Vol. 57, No. 4, 2007, pp. 589-597. Substrate for Solid-State Cultivation of Aspergillus sp. M. Nampoothiri, T. V. Baiju, C. Sandhya, A. Sabu, G.
ology, Vol. 40, No. 3, 2009, pp. 623-630. 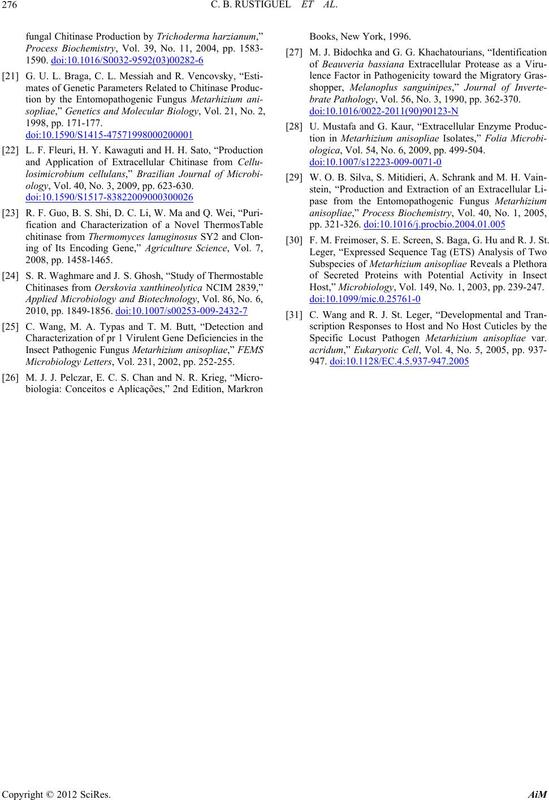 Microbiology Letters, Vol. 231, 2002, pp. 252-255.
brate Pathology, Vol. 56, No. 3, 1990, pp. 362-370.
ologica, Vol. 54, No. 6, 2009, pp. 499-504. 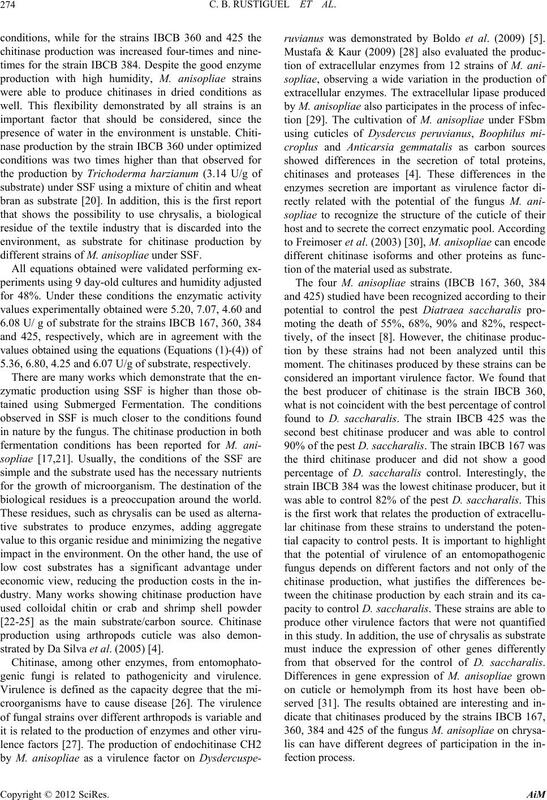 F. M. Freimoser, S. E. Screen, S. Baga, G. Hu and R. J. St.
Host,” Microbiology, Vol. 149, No. 1, 2003, pp. 239-247. Specific Locust Pathogen Metarhizium anisopliae var.